With the advent of the internet and email services, most of the offices around the world use fax machines to send documents to other companies and businesses. Just like every other thing that gets evolved with the internet, fax service also evolved. Today, you don’t need a fax machine and fax line to send a fax. You can now easily avail fax service via online fax services available on the internet. You don’t have to deal with those clunky old machines and waste office space because of them. With online fax service, sending fax has become way easier. You can also send free fax online as there are services which allow you to send a limited number of fax without any cost. 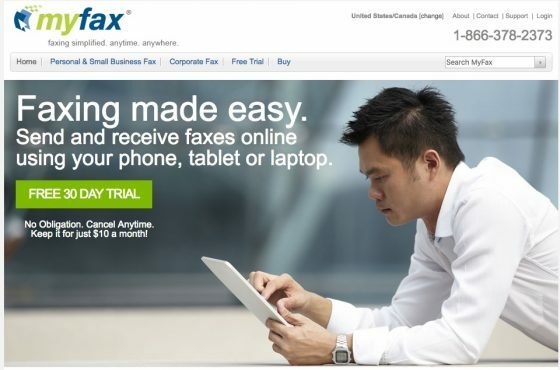 MyFax is one of the best online fax services. This faxing service comes with a 30-day free trial which you can use and experience its features. If you are satisfied with the services and features provided by it, then you can purchase the subscription at mere $10 per month. To get a free trial, you do need to give credit card details, but you have to cancel the trial of this service within 30 days to avoid paying $10. After signing up, you can start sending a fax. With a short setup wizard, it sets up location and generates fax number which can be given to anyone who wishes to send you any fax. On running the service, you are presented with few options for adjusting profile and preferences along with options for viewing and sending faxes. When you send any fax, you have to fill in few fields which will create a cover letter and upload space where you can attach PDF, pptx, docx and other supported formats. For any fax you wish to send, you can send it up to 50 individual contacts to receive the document. One of the nicest feature of MyFax is the MyFaxCentral, which is an online repository which stores all sent and received faxes. When you open the Sent Folder, you can locate the fax which was submitted for delivery. The information of the fax includes the destination fax number, notification for successful or failed delivery of fax, and an actual image of the document. If you go for a paid account, you can keep all your faxes stored indefinitely. MyFax is a genuinely great faxing service which offers a simple and user-friendly interface at a reasonable price and will fit most of the requirements of small businesses. Now if you have tried its trial version, you can cancel the service with ease, either at trial phase or at any time during your paid subscription. You can always get in touch with the customer support representative of MyFax via its text chat portal. Cancelling your services is quite easy and takes a few minutes to do so. So, if you are looking for web-based faxing service which frees you from hassles of keeping a fax machine, MyFax is the fax service we recommend. With this, we end our review of MyFax. Don’t forget to mention your reviews in the comments section below.